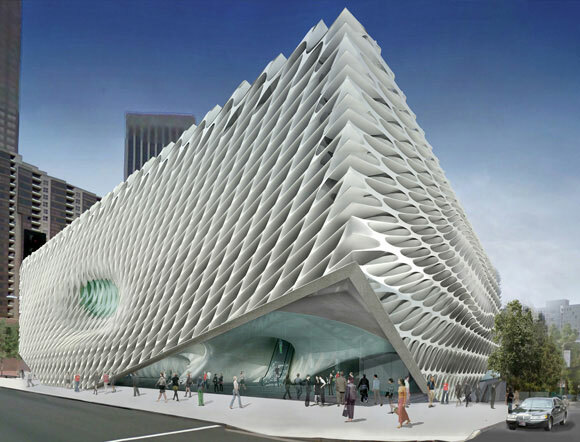 Late 2015, Los Angeles will welcome two new museums: the Petersen Automotive Museum and the art museum simply called, The Broad. Before discussing these civic structures, let’s step back to the architecture of museums in general. Traditionally, museums are empty vessels that come to life when artwork is inserted. This museum architecture is a neutral backdrop. In opposition to this premise, architect Frank Gehry’s 1997 Guggenheim Museum is a work of art itself, and symbiotically co-exists with the art and sculptural installations. Considered one of the most influential living architects, Gehry created for Bilbao in Spain a design that counters the classical muted environment for art. By doing so, this museum has been hailed as one of the greatest buildings in current history. In yet another approach, when Frank Lloyd Wright completed his Guggenheim Museum in New York City in 1959, visitors were stunned. No defined galleries existed, but rather, a continuous sloping floor of exhibits spiraled up six stories. Complaints from curators were immediate. If they were to hang art parallel to the ground as one typically does, then it would be crooked to the sloping floor of the museum. But if the curators were to hang art parallel to the sloping floor, then the art would be at an angle—a warped viewing for visitors. When Wright was questioned, he responded with indifference: the curators’ concerns were insignificant. The architect proclaimed that visitors have come to see art. And here, the art is his architecture, the building itself. Not the negligible objects within. Back to the present. 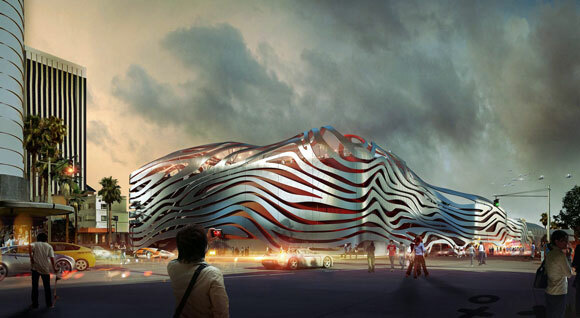 The soon-to-arrive Petersen museum, at a price tag of $125 million for 300,000 square feet, is designed by New York-based, corporate giant Kohn Pedersen Fox Associates. The new Broad museum, $140 million for 120,000 square feet, is designed by New York-based creative studio Diller Scofidio + Renfro. For both the Petersen and the Broad, the large buildings present an aggressive exterior. Both facades are radical and alluring. 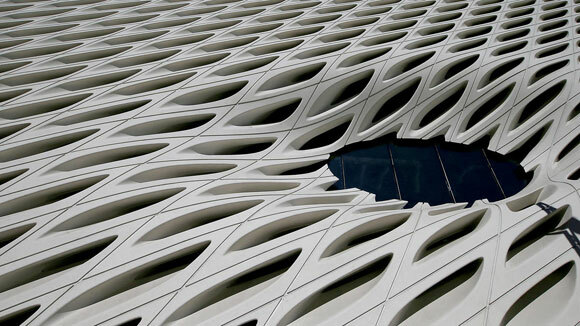 With a muscular honeycomb skin of precast concrete, the Broad is an enigmatic and commanding building. Called the “veil” by the architects, this elusive skin looks to the future, with an unintentional throwback to the 60’s office buildings that also employed modular concrete exteriors. At the Petersen, a bizarre facade of seductive stainless steel ribbons wraps a bright red building. According to the architects, this design “evokes the imagery of speed and the organic curves of a coach-built automobile.” Though appropriate as a design theme for a museum of cars, I frankly don’t see it. It appears to be like an uncomfortable extra-terrestrial armor, instead of the sophisticated lines of a Citroen or Alfa Romeo. Here’s one big thing that separates the two exteriors. The sculptural outside of the Broad is a beautifully patterned concrete fabric that is integral to the structure of the building. Also, this “veil” cleverly diffuses sunlight into the museum, providing bright and stimulating gathering spaces. The endless ribbons of the Petersen are merely tacked on, superficially applied like mascara. 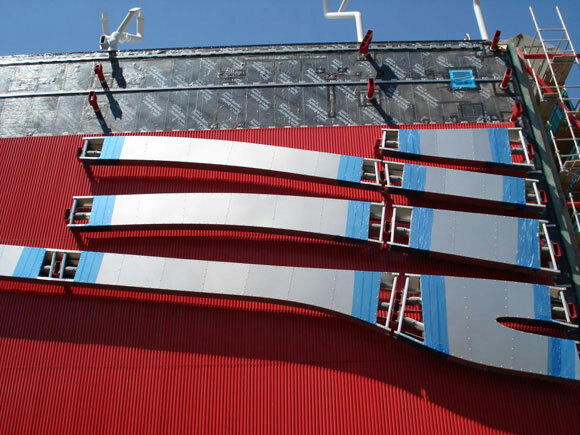 Not even a part of the building’s structure, the zippy ribbons have no impact on the actual journey through the museum, other than the initial impact of a billboard that you see, read, and pass by. When the two museums are unveiled to the public, the quality of the interiors, the scale and character of the galleries, and the voyage from one exhibit to the next will all be judged. Today’s vote of confidence is for The Broad. I see the pioneering vision that architects DS+R have created in their other outstanding works of civic architecture, such as the impressive High Line, a one-and-a-half-mile long, outdoor recreational space and social connector, hovering over the streets of Manhattan. KPF’s Petersen museum tries hard with their automobile metaphor, and perhaps too hard. This design is a dangerous one-move dance number. At first glance, I am impressed with the self-assurance of form and color. Later, I am already fatigued by the architecture’s brashness, wishing there was some subtlety and depth. For both projects, I enjoy the qualities of strength. Both architecture companies possess courage. Though some critics are tired of “statement” architecture—the headline grabbing designs—a museum needs to be exactly this. Museums are one of those rare city structures that speaks to the broadest community. Standing for generations, these buildings house the great minds of our artistic present and past.